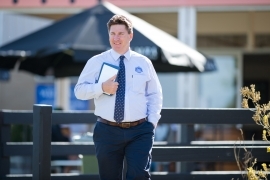 Incumbent Inglis Managing Director Mark Webster has agreed to remain in the role for a minimum of two more years. “Mark had earlier decided to retire from executive duties and we had invited him to continue as a non-executive director,’’ Inglis chairman John Coates said. “We engaged a leading recruitment company, searching both here and abroad, however after six months we were unable to identify anyone with the right balance of corporate, leadership and racing industry skills and experience required for this important role. “Accordingly, we asked Mark to put on hold his personal plans and we are most grateful that he has committed for another two to three years. Webster said the decision to remain on as Managing Director made sense and was something he was enthusiastic about. “When I made my decision to stand down as an executive earlier this year it was after a challenging couple of years which were focused on relocating the Sydney business to Warwick Farm and getting the new facility and hotel off the ground,’’ Webster said.